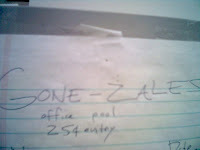 About six or seven weeks ago, when it looked like maybe, just maybe, Alberto Gonzales would be forced to resign from his post as Attorney General, KPC started a little office pool: when would he be Gone-zales? So people placed bets by writing down dates, and then scotch-taping quarters and a lone dollar bill to a sheet of legal pad paper. 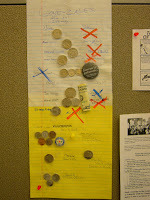 The winner would get a grand total of $3.88 (we work at an underpaying non-profit). My guess: sadly, May 24th. (I was feeling particularly optimistic.) Predictions ranged from late May to Election Day 2008. An X marks a date guessed and passed, a moment of hope come and gone. What started as a fun convergence of office camaraderie and a seeming sure thing has now become a monument to an administration's amazing ability to ignore public sentiment and Reason altogether. (White) House always wins, I guess.